A zero gravity chair, almost an obligation to relax. Once adjusted, the multi-position function is lockable to the one that suits us. The comfortable armrest and the fluffy pillow complete the chair nicely. Take up little storage space and fold effortlessly in seconds. No assembly required. This chair is low maintenance, easy to clean. Inspired by the Provence region of Southern France, Vineyard pieces are fashioned from chateau style manors, with subtle wingback details. The design of this motion lounge chair combines resin weave and aluminum, two of the most durable and weather resistant materials in the industry. This motion lounge chair includes a hydraulic recliner lift that allows for infinite adjustments. Relax with the cozy CorLiving Park Terrace Collection this summer. The PPT-341-C chair with generous arm rests and deep back matches the rest of the Park Terrace sectional set. The textured black resin rattan weave is complimented by high quality, weather resistant foam seat cushions wrapped in zippered and washable teal covers. Ready to use upon delivery, you can complete your summer patio set with this comfortable chair from CorLiving. Expand the indoors out to your patio deck this summer. Its easy to relax in the extra large CorLiving Seattle Collection. The PPS-601-C Chair features thick arm rests and a rounded deep back pillow design. The curvy black resin rattan weave is complimented by high quality, weather resistant foam seat cushions wrapped in zippered and washable Sultry Grey woven seat covers. As part of the PPS-601 series, you can mix and match to make the configuration you need. Ready to use upon delivery, complete your deck with this ultra-comfortable patio chair from CorLiving. Multi-Position Chaise with stripe A zero gravity chair, almost an obligation to relax. Once adjusted, the multi-position function is lockable to the one that suits us. The comfortable armrest and the fluffy pillow complete the chair nicely. Take up little storage space and fold effortlessly in seconds. No assembly required. 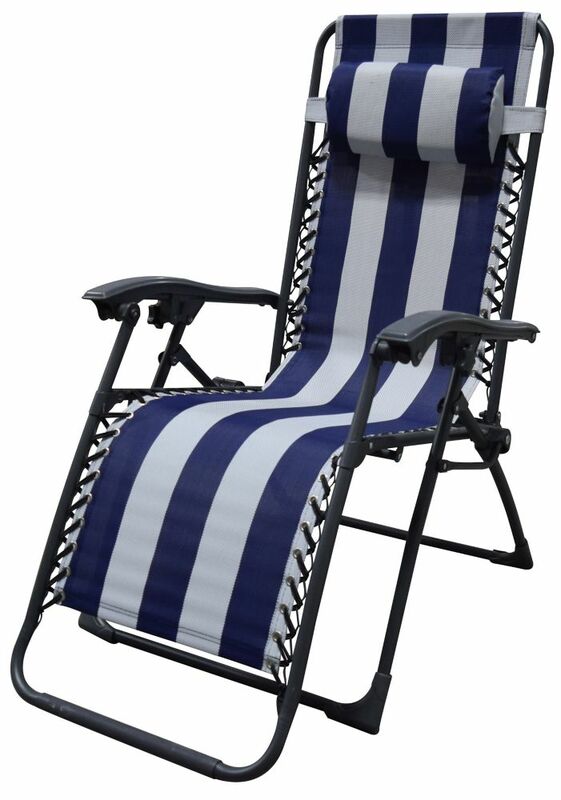 Multi-Position Chaise with stripe is rated 4.0 out of 5 by 1. Rated 4 out of 5 by Nina from Really nice relaxing balcony or patio chairs Really nice relaxing balcony or patio chairs. We just love them. They look solid and nic. What is the maximum weight this will hold? Thank you for the interest in our product. The weight limit is 225 lbs.